Celebration cakes are my favorite cakes to make. I’m not particularly apt at piping icing designs or writing messages, but I can usually come up with something creative to complement the flavors under the icing. 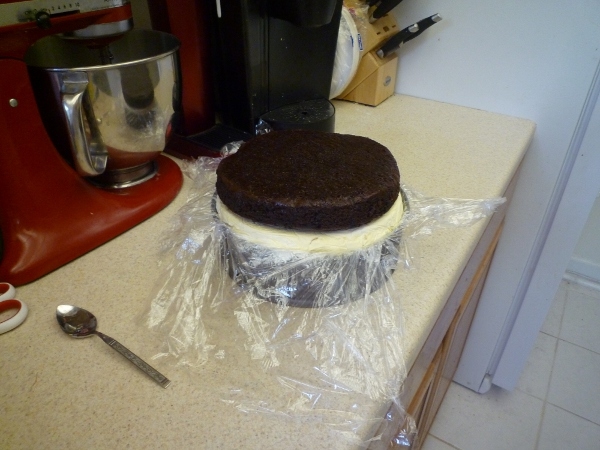 The person the cake is to be for inspires me with their choice of flavors and then from there…a blank canvas. No rules, no rubrics to follow, no required homework, just good creative fun. When Joe told me several weekends ago that his dad’s birthday was coming up, I offered to make the cake and asked what kind he thought Roger (his dad) would like. I had no idea. I didn’t even know if I had a powerful enough freezer, or for that matter, one with enough space to freeze multiple cake layers. I resolved to try, because (as they say) if you don’t try, you’ll never know. One thing I did know was that Roger loves chocolate, so what better to include than my personal favorite perfect chocolate cake recipe. I made two 9in. layers of Ina Garten’s Beatty’s Chocolate Cake. After cooling completely on a rack, they were wrapped and placed in the freezer to firm up. The next step was to create the ice cream layers. 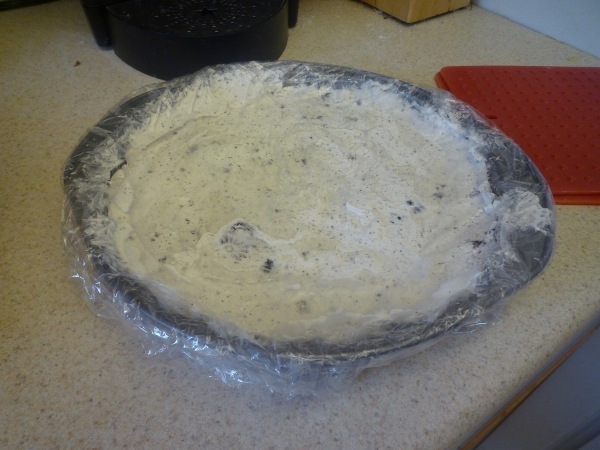 After lining two nine-inch rounds with plastic wrap (so I could lift the layers out later), I scooped and flattened softened ice cream into each–cookies and cream in one, and vanilla in the other. Using an offset spatula, I smoothed the surfaces even as best I could, then covered each with another layer of plastic wrap and then put them in the freezer to harden. After a day, I lined a springform pan with plastic wrap and stacked the layers together. 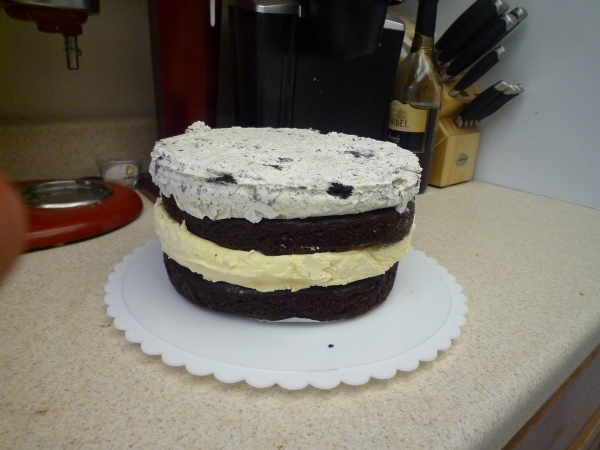 First the cookies and cream ice cream, then a layer of chocolate cake, then the vanilla ice cream and finally the second chocolate cake layer. I wrapped the whole cake tightly in plastic wrap and returned it to the freezer. Two days later, I turned the cake out of the springform pan and onto a turn table. 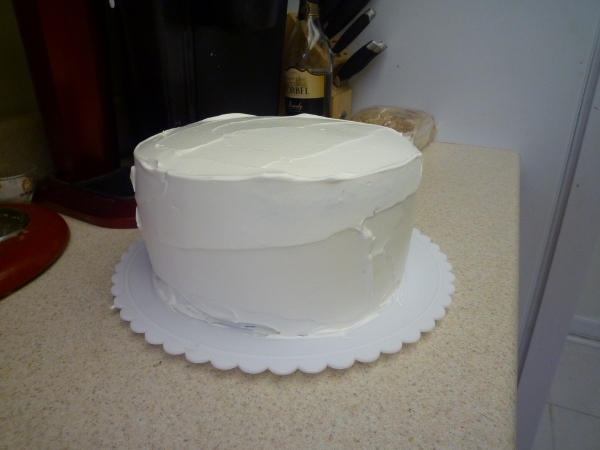 By that time, the layers had frozen firmly together and I was able to do a quick crumb coat of icing. I used Cool Whip, by the way, as it will firm up in the freezer, but won’t get too hard. I let another 8 or so hours pass and then put on a final coating. I also moved the cake from the turn table to an aluminum foil covered piece of cardboard that I’d cut to fit inside of a cake box that the kind folks at the bakery near my office had graciously given to me. As for decorating? Well, by the time I’d iced the cake I was so amazed that it had actually come together that I was hesitant to ruin it with a bad attempt at writing “happy birthday” on top. What I did instead gave me a lot of flexibility. I melted a bag of semi sweet chocolate chips over low heat, mixing constantly until just smooth. I then poured the melted chocolate into a pastry bag fitted with a rounded point and piped lots of little shapes onto big sheets of wax paper. I made swirls, stars, zig-zags, curls and other odd little designs that I thought might look interesting. 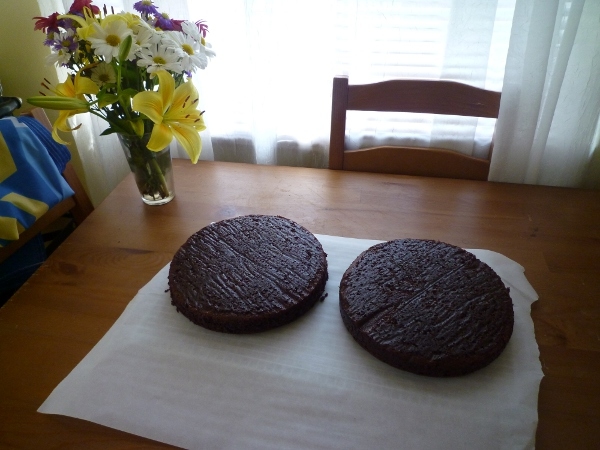 After they hardened, I topped the cake with them by gently pressing an edge of each into the icing until it stood. 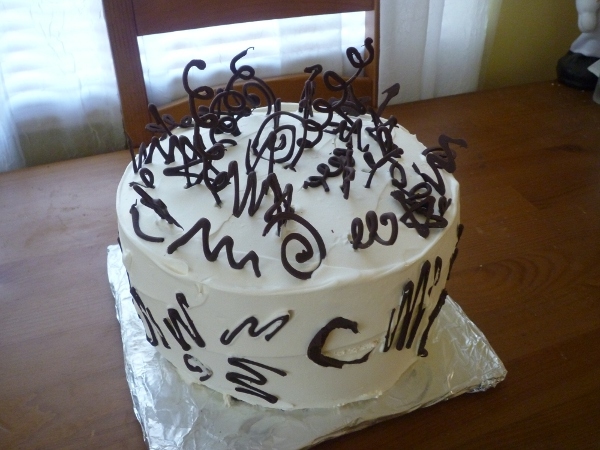 I wanted an explosion of chocolate stars and fireworks bursting forth from the icing. Because this cake, if it were to personify anything, I would want it to be joy. With the freezer turned to its highest setting, I returned the cake to it once more to prepare for its final 10 minute trip to Joe’s parents’ house. Fortunately, Joe had pre-warned his mom to make freezer space, and it was quickly tucked away to wait patiently for its unveiling after dinner. At last I saw it opened, still decorated and stable, and was finally able to breath a sigh of relief. And the inside looked really cool! I was really proud of this, especially once I saw how well it held up after we took a few slices out. 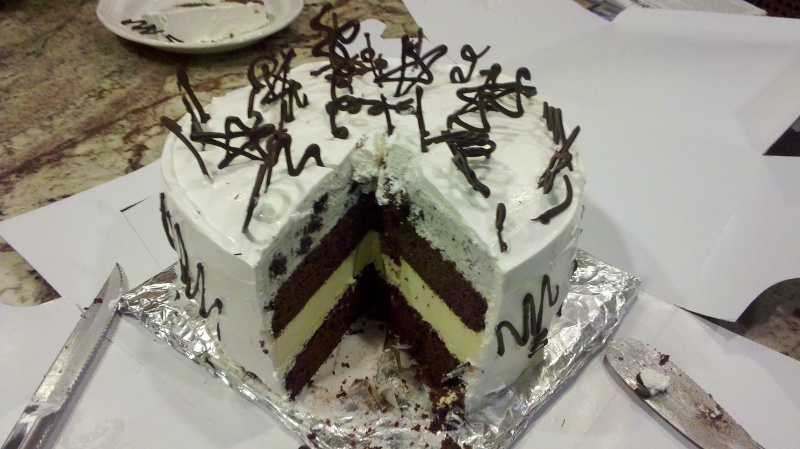 Aside from the icing starting to get soft, the layers of cake and ice cream remained remarkably firm and tasted oh-so-good. After Roger had two slices, I felt comfortable in assuming that it was in fact, delicious. What I learned throughout this little endeavor is that ice cream cake doesn’t take a ton of time on any given day, just the patience to take small steps in between freezings. While it took me the course of a week to make, I worked on it for maybe 5 minutes each day either stacking, unmolding, icing, or decorating. An exercise in patience? Yes. Worth it in every way when I saw the smiles on the faces of the folks around me eating it? You bet.